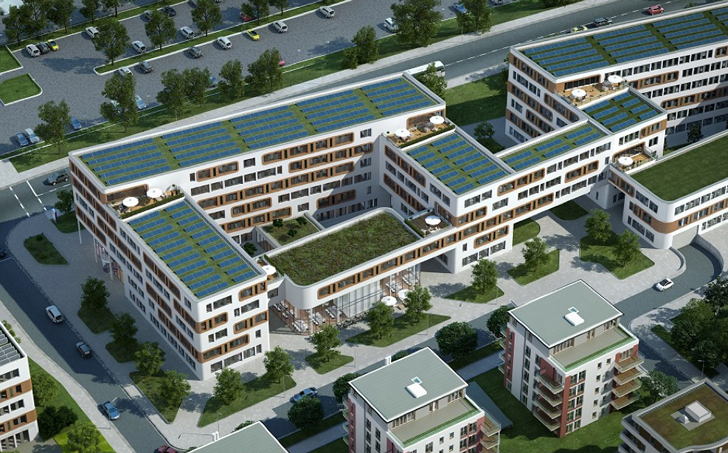 Munich, Germany now boasts the greenest office building in the world. NuOffice is off the charts in all sustainability metrics, easily achieving LEED platinum status. 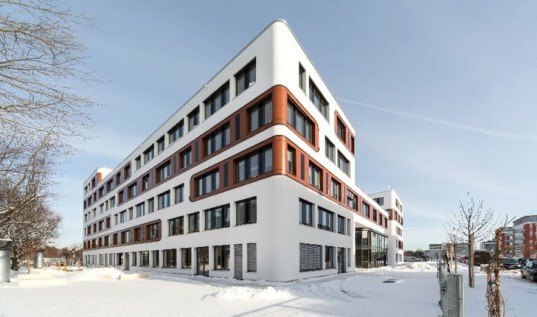 European research project DIRECTION and scientists from Fraunhofer Institute for Building Physics banded together to help design the über-green building, hoping it will serve as a model for future new construction across the globe. In order to raise the bar on the building’s energy efficiency, the science and research team sought to maximize the building’s passive energy use, driving down energy consumption and introducing renewable energy sources as main suppliers to the building. NuOffice’s roof alternates between lush, insulating greenery and a powerful photovoltaic array that adds to the building’s power needs. Radiant heating and cooling systems, which are connected to a complex district heating system in the basement that also employs well water to cool in the summer, help to keep energy usage low and the interior comfortable. The building’s inner courtyard design fosters not only an additional green space, but also creates natural cross breezes and an influx of daylight on both the inside and outside perimeters of NuOffice. Thickly insulated exterior walls and triple-glazed windows also keep the interior climate comfortable. The newly opened building’s energy usage is being closely monitored and recorded. The team hopes that by the end of the year the energy consumption will consume just 30 killowatt hours per square meter per year, compared to the average of 100 to 150 killowatt hours in a standard office space. Is the building assembled in an environmentally friendly way though? The greenest office building in the world is in Seattle, WA. The Bullitt Center. In order to raise the bar on building sustainably, the science and research team built to maximize the building’s passive energy use, driving down energy consumption and introducing renewable energy sources as main suppliers to the building. NuOffice’s roof alternates between lush, insulating greenery and a powerful photovoltaic array that adds to the building’s power needs. Radiant heating and cooling systems help to keep usage low and the interior comfortable, achieved with a complex district heating system in the basement that also employs well water to cool in the summer. The building’s inner courtyard design fosters not only an additional green space, but also creates natural cross breezes and an influx of daylight on both the inside and outside perimeters of NuOffice. Thickly insulated exterior walls and triple glaze windows also keep the interior climate comfortable and in control. The newly opened building’s energy usage is being closely monitored and recorded. The team hopes that by the end of the year the energy consumption will consume just 30 killowatt hours per square meter per year, compared to the average of 100 to 150 killowatt hours in a standard office space.